With the sale of a couple of guitars – I decided I wanted to experiment with an extended range instrument – but didn’t want to spend a lot of money. I had been looking at the Damien Elite 8 – which I saw in this video. I liked what I heard of the instrument – but then found the 2011 Omen 8 was released and $200 cheaper than the Elite (with free shipping from Amazon) so I bit the bullet and gave it a try. 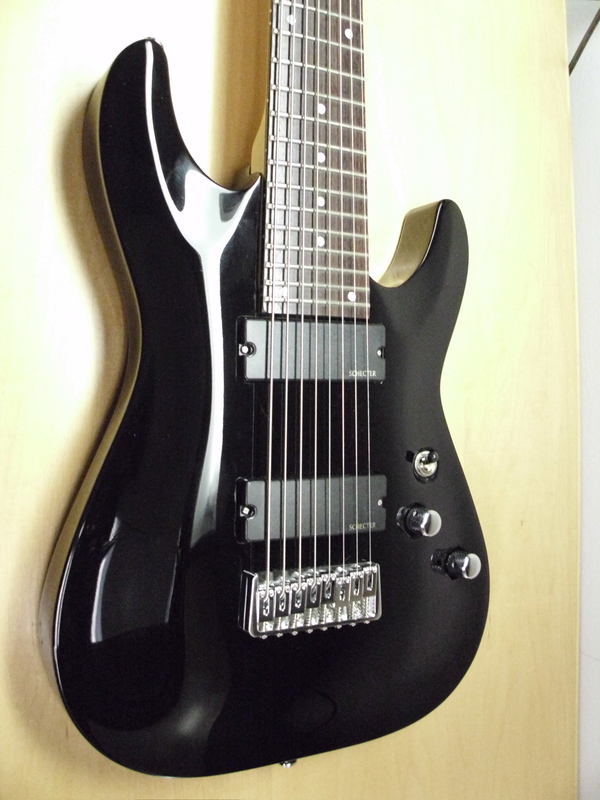 The Schecter Omen 8 – is a South Korean built guitar that is set up and shipped in the states. Frankly, it’s a lot of guitar at this price point. The guitar has a basswood body with 2 Schecter brand pickups and eight string bridge. In comparison, the Damien Elite has a mahogany bodywith a quilted maple top , multi-ply binding and active EMG-808 pickups. The body itself is surprisingly contoured. While I was surprised to see a belly cut, a wrist cut would benefit the model as well. 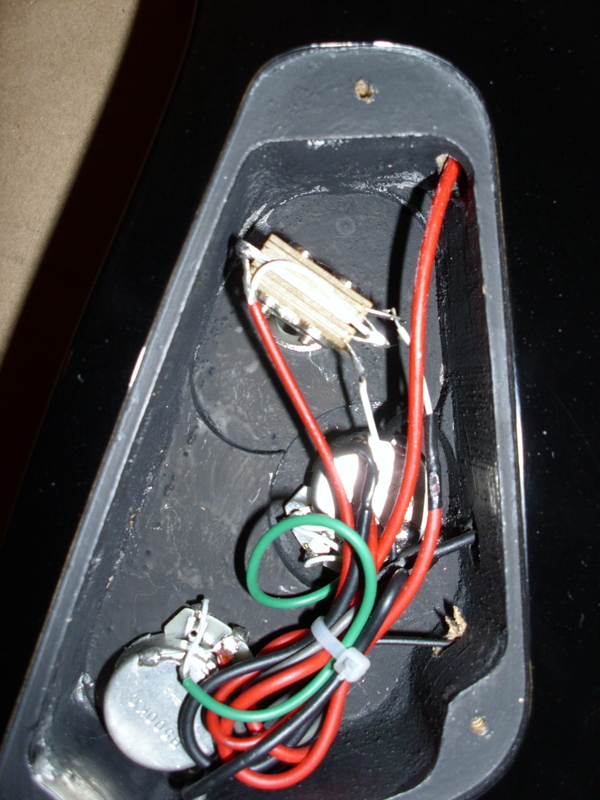 The routing for the electronics is clean, and the finish is top notch. The string through body bridge works well. The pickups are functional but a little lackluster. (Part of this could be the basswood body – Another reason I like bolt on necks vs. neck though body. In a bolt on neck if you hate the neck but like the body (or vice versa) you can just switch it out. With a neck through body – you buy a new guitar). I’m not a fan of active pickups so I would probably plan on replacing them even if I sprung the extra money for the Elite. The 24 Jumbo fret bolt-on maple neck has a rosewood fingerboard and a 26.5″ scale to accommodate the extended tuning of the instrument. Note: you could make the tuning whatever you wanted – but it’s strung with what appears to be a D’Addario stings (update I’ve been informed on the sevenstring.org forum that Schecter’s standard 8-string set is: .10 .13 .17 .30 .42 .54 .64 .74 – thank you sir!) for a low to high tuning of F#-B-E-A-D-G-B-E. The Schecter tuners are functional (you get Grovers on the Damien Elite) and the inlay is a simple dot inlay (instead of the more elaborate “stained cross” inlay on the Elite). The joint itself is a little chunky. Given the amount of string tension on the neck – this isn’t that surprising but it does mean that in performance the top two frets are basically for show. Setup wasn’t bad but needed a little more tweaking. In addition to the F# intonation being off the nut action was pretty high for some of the strings. I know the lowest string needs extra room to vibrate – but it was really high on the E, A and D strings as well. Especially on the higher frets. The guitar sustains well acoustically without amplification but – the shipped string (I believe a.074) on 26.5″ scale is really too small for the low F#. At that pitch the string just flops on the fretboard. Also in terms of timbre – the F# is a little strange to me. It seems to fight between wanting to be a bass and a guitar. I could get some nice sounds with clean tones – but I had a really hard time integrating it with any kind of distorted tone. Part of that could be the pickups as well. The high gain tones that sounds best for single pitches turn to mush on chords so there’s a balancing act there. Going up to a .08 would probably tighten it up and I may got that route eventually but for now I wanted to go more well rounded. Having said that – the scale length is workable by getting rid of the F#. The tuning I’m using right now is (low to high) B-E-A-D-G-C-E-A. This uses the above mentioned D’Addario 7 string pack with a .007 for the high A. I’ve also swapped out the .059 for a .062 for the B which seems to feel better. Here are a couple of suggestions that will help if you use the high A tuning. You’ll have to adjust the intonation when using a different string. Start by removing the lowest string (in this case F#). 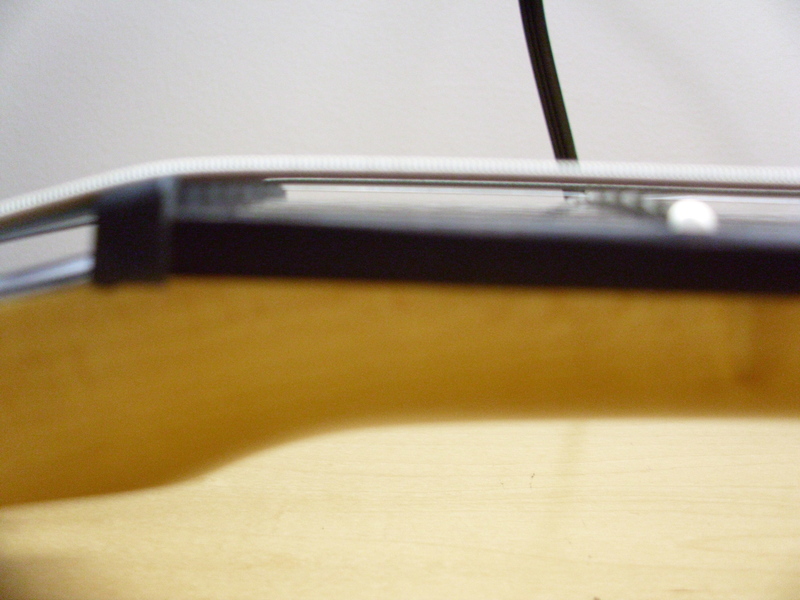 Before you put the new string in – move the saddle so the front edge is in line with the saddle on the low B string. (Do not adjust the height screws! All you’re doing is adjusting the string length so that the string intonates properly. Since the other strings are already intonated – this will cut down on time adjusting it substantially). Leave the top string (the High A) where it is and adjust accordingly. I’ve tuned the B string up to C. This keeps a 4th between the E and high A string (top 2 strings) and a 3rd between the C & E strings. This way all of my 3 note per string scale patterns stay the same. There’s a company that sells strings specifically for high pitches on extended range instruments called Octave4Plus. While I may look into their strings in the future – while I was waiting for the guitar to come – I put an order into Just Strings and ordered 2 sets of the D’Addario 7 string packs and 5 single .007 strings to see if I could do it on my own. (Update – you can read an Octave4plus review here) – What I wanted to see was if the string would snap near the nut or at the bridge. When I tuned the first string up – I tried to get it to pitch and it snapped at the tuner. What I recommend you do is tune the string up to F# or G and let it sit for a while. Tune the other strings. Every 3-5 minutes or so – try to bring it up another 1/2 step and repeat until you get it to pitch. By letting the string stretch at various points – it becomes more stable under pressure. 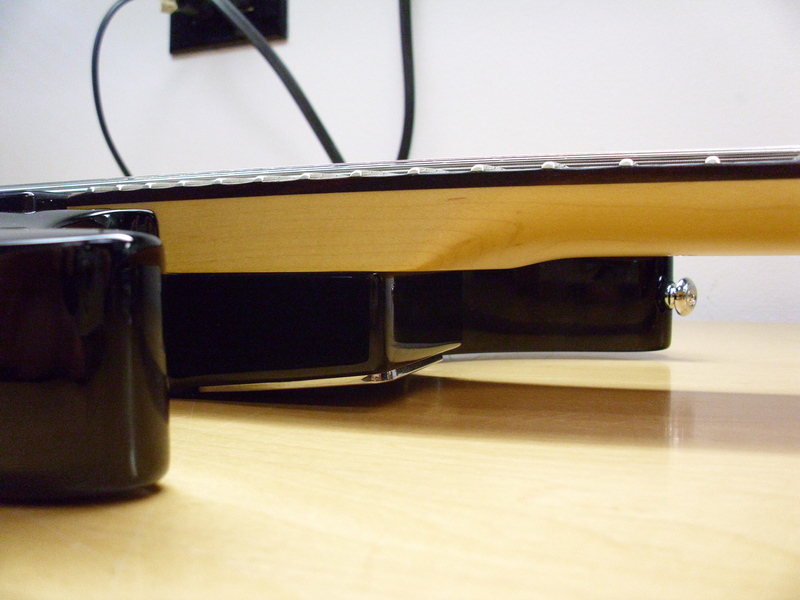 In using this tuning – I wonder how it would work in a 25.5″ scale. The advantage of that to me is that I could use .011s (or .012s!) for the 6 strings and then fill in the top and bottom appropriately. I can’t help but think that heavier gauge strings would drive the pickup more and result in better tone. The issue there would be the floppy low B. Every variation is a series of compromises – just something to consider. 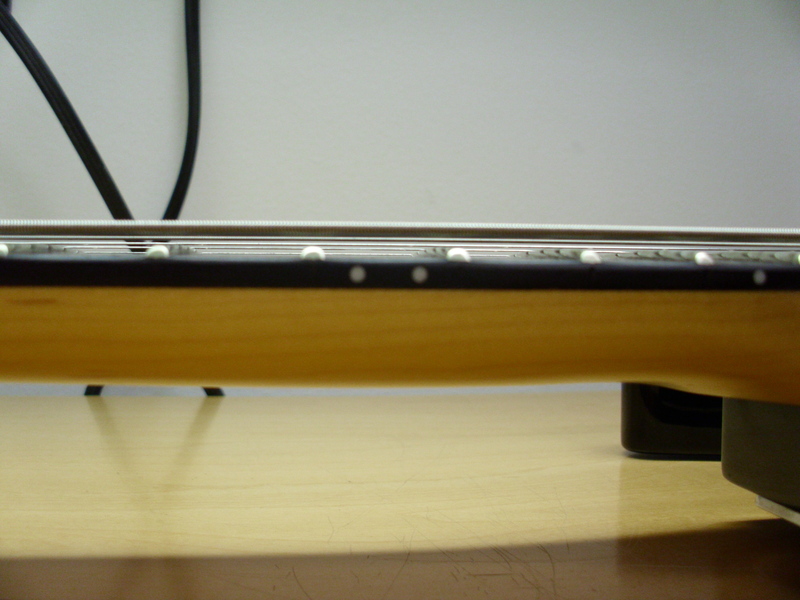 In moving the strings – you will probably have to adjust the nut slots. I’d recommend having a qualified guitar tech do this if you’re not sure what you’re doing. I am constantly amazed at the cost point versus quality of work that is coming out of South Korea these days. If Amazon is selling this guitar at $400 (I rounded up for convenience), that means that it’s probably leaving South Korea at a cost of $150-$200 shipped – which is pretty mind boggling if you think about it. Count on spending some additional cash on setup right out of the gate. Further on down the line – you will probably want to put money into pickups and perhaps tuners as well. If you like active pickups, or want a really nice looking figured top- this is a no brainer – save up an additional $200 and get a Damien Elite 8. Otherwise – minus the top and the pickups – this is basically the same guitar for 1/3 less money. I’m still sorting out how to play this!! In the meantime, you can read more and hear some mp3s here. If you’re looking for a gig bag for one of these – the Gator Viper is the best deal out there right now. In the meantime – If you have any questions – please feel free to drop me a line @ guitar.blueprint@gmail.com ! This entry was posted in Gear, reviews and tagged 8 string guitar, 8 string guitar string gauges, Extended range guitar, Schecter Damien Elite, Schecter guitar, Schecter Omen 8, Schecter Omen 8 Review by GuitArchitecture. Bookmark the permalink. Thanks for the in-depth review! I just discovered this guitar and found your analysis quite helpful. I too wondered about a low B to high A tuning, so it was nice to see that mentioned. In answer to your question….maybe? The gauging is really strange to me. Strings are cheap enough that you should just get a 6 string pack and then swap in the low and high strings. I use D’Addario 10’s with a .63 for the B and a .007 for the A – at standard pitch and it holds up. I might drop down a 1/2 step as the high A is VERY tempermental – but I’ve actually been thinking about going to the Full nickle .11s. I really enjoy this review. I got a question though. I would be purchasing this guitar for metal (i like keeping my acoustic and jazz on a 6 string). How do you think it holds up to metal if you play it? I’m torn between this and the agile intrepid 828. I think the 28 inch scale would be better, but this guitar seems nice. Any more info you can give? Thanks for the post. I think the Schecter’s a great deal for the money. I’ve played my friend’s agile so this is based on that. Bolt on neck is a plus for me – but joint with the guitar is a little bulky – don’t plan on soloing a lot in position above the 19th fret. The Agile scale IS longer – so if you’re jonesing for that LOW F# – you can use a lighter gauge string to get to it on the Agile. If you like EMG’s I’d say just get the Schecter Damien Elite. I don’t like EMGs and like Bolt-ons so the Omen was a better deal for me. Either way – plan on spending $ for pickups. Both are fine for metal. Sorry – I went the other way and have a high A string and the low B. Just try experimenting but I’d expect something in the .090 – .1 range. well i dropped it down to D !!!! and its holding and i am learning be more precise but still have a great time playing. i am going for an agile next!!! yippee !!! I’d recommend talking to the Bare Knuckle Pickup guys. Really good guys and they’re super knowledgable. The Seventh String forum has a lot of chat about good Djent pickups as well…. My saddles have rusted and i cannot adjust them…I tried changing the saddles of the guitar but the one’s I ordered are a little bigger than the stock saddles in the omen 8 and they do not fit in properly in the bridge. Do the saddles come in sizes? If yes, then which ones should I get for the omen 8. Yes – saddles come in different sizes. 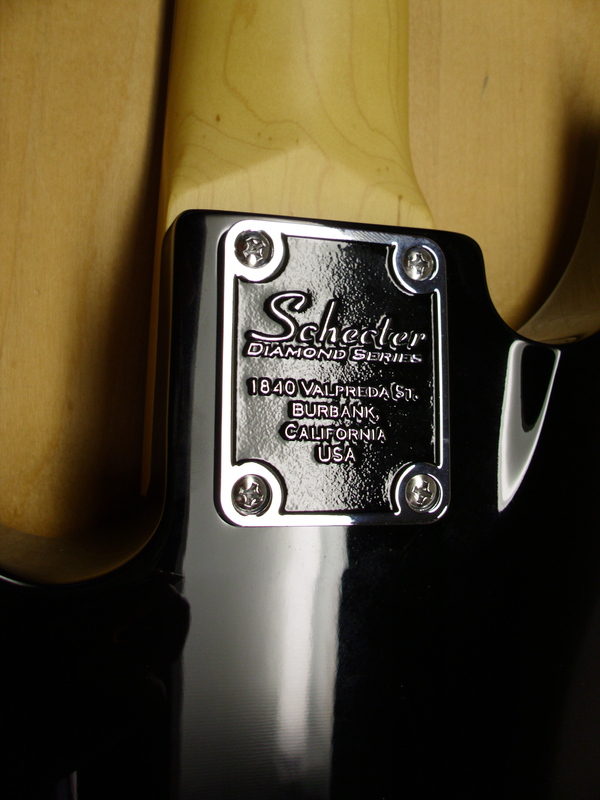 I’d recommend you try contacting Schecter directly for replacements.